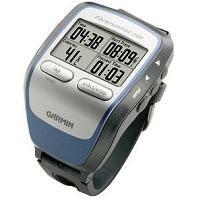 The Garmin Forerunner 205 is a GPS-enabled sports watch primarily intended for outdoor running. It is NOT a heart rate monitor. It does not have heart rate monitoring capabilities. Having said that, it is an excellent sports watch for running, if you do not need or wish to monitor your real time heart rate. The wrist watch can show up to 3 data pages. Each page can have up to 4 fields. Therefore while you are running, you can examine in real time up to 12 pieces of data. Autoscroll - if this is turned on, the data pages are shown one after the other automatically. Calorie counter: It is based on distance and user profile data. 10 pace/speed zones which you can customise to be used in conjunction with pace/speed alerts. There are 3 sport modes: Running, Biking and Other. Time alert: Beeps when you have trained for a specific time. Distance alert: Beeps when you have travelled a specific distance. Pace/speed alerts: The watch beeps when you have gone above or dropped below your set pace/speed zone. Auto Lap: laps are marked automatically when you have travelled a certain distance or passed certain points during the run. Virtual Partner: Competes against you automatically during quick workouts and courses. The wrist watch display will show whether you are ahead or behind. You can now set up 3 types of workouts (if you wish): quick, interval, advanced. See below for more information. Quick workout: You can set one of 3 goals: 1. distance and time, or 2. time and pace, or 3. distance and pace. A Virtual Partner will race you to help you achieve your goal. Interval workout: First you set the time (or distance) you want to run and the time (or distance) you want to rest. This defines your intervals. You then decide how many times you want these to be repeated. This sets up your complete interval workout. Advanced workout: You can set up multiple intervals, with each interval having a different time duration or distance. You may also set goal for each interval individually. You can use the included Garmin Training Center software to set up the workout on a computer and then download that to the wrist watch. Course: You can set up a course based on a previous recorded run. Then you can race against the course, and see if you can better your previous performance/goal. You can use a Virtual Partner to help you with that. You can do a multi-sport workout, without resetting the stop watch timer. Simply change the sport mode while doing the workout. This way you will get the totals and the averages of the entire workout. Stop watch with up to 1000 laps. 1000 laps of history data is saved for review. The data includes time, distance, average pace, best pace, calories and detailed lap information. There are various GPS navigation features on Garmin Forerunner 205: Viewing your path on a map, marking locations, finding your way to the starting point, and creating and using routes. Waterproof i.e. splash/rain proof. It is NOT intended to be used while swimming. The wrist watch unit uses an internal rechargeable battery. It comes with its own special charging cradle. Battery life is about 10 hours when fully charged. A special USB cable is provided to transfer data to a computer. Use the Garmin Training Center desktop software to analyze or store your history data, or use it to create an advanced workout or a course. You can also upload data to Garmin Connect, an online software, for analysis, mapping, and route sharing. Note: On Garmin web site or manuals, the words "heart rate monitor" are used to denote the chest strap transmitter. This is in contrast to standard usage where "heart rate monitor" either refers to the wrist watch unit or to the combination of both the wrist watch unit and the chest strap transmitter. So please be aware of the difference to avoid confusion. It is clear that Garmin Forerunner 205 GPS Sports Watch is a great runner's watch, great for those training focuses on pace/speed. It also offers a host of very useful navigational features. For example, it is fun to race against your past record over a particular route. It is certainly useful to get the Garmin Forerunner 205 to help you find your way back home if you happen to get lost! There are many ways to these navigational features. However, the one point to remember is that the Garmin Forerunner 205 is NOT a heart rate monitor. If you like the features of the Forerunner 205, and also want to have the heart rate monitoring facility, then the Garmin Forerunner 305 is your choice. It has all the features of the Garmin Forerunner 205, plus heart rate monitoring, plus the ability to add an optional bike speed/cadence sensor or optional foot pod. Further information: Visit Garmin's official web site.